EB in Elmsford at a confusing sign, courtesy Michael Summa. The ramp to the left is the end of the Cross Westchester Expressway, which splits to go to New York (south via I-87) or... Upstate (north via I-87/287). 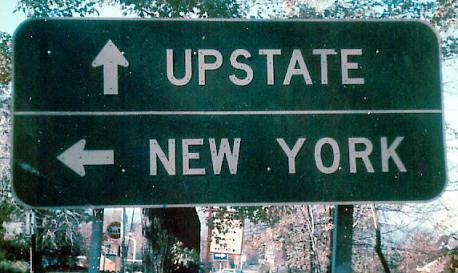 So why is Upstate signed straight ahead? 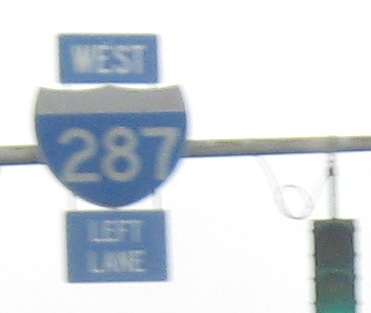 For once, a state signs traffic to use the free way, I-287 EB to the Taconic State Parkway NB. This sign dates from a short time when NYSDOT riveted on reflective letters to semi-reflective backgrounds on these LGS's. 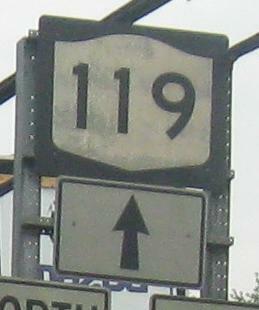 On top of some new NY 100 shields, 119 EB keeps its old shield and an old-style arrow underneath. 100 itself has more old shields at this intersection. Running through the SB/EB duplex to the breakup at the Bronx River Parkway onramp (Central Avenue). Up here, the Parkway is an expressway, not a freeway, meaning that Central Ave. comes to a traffic signal to allow access to/from both directions of the Parkway. Facing the other direction, NY 119 WB before and then at NY 100. Martin Luther King, Jr. Blvd. NB in White Plains at Main St., NY 119 EB.